This article has been produced from the contents of a book entitled “The Fort on the Hill” which was written and published by Terence J Knight BEM, a former Credenhill Parish Councillor who also served in the Royal Air Force. In 1939 – in preparation for the Second World War, Defence Lands requisitioned the site occupied by the Royal Air Force at Credenhill up to 1994. 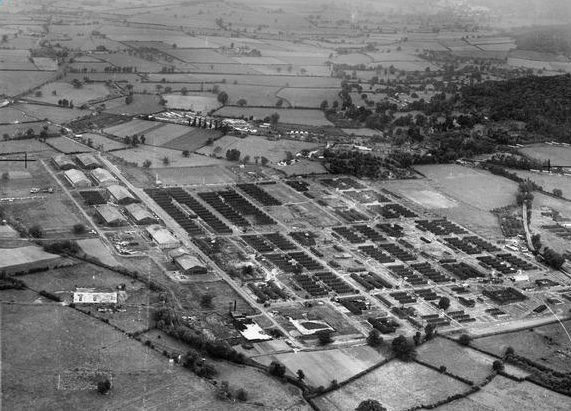 October saw the start of an intensive building programme and by April 1940 over 1000 labourers were busy turning the site to the West of Hereford into a city of wooden and brick huts. In June 1940 Royal Air Force Hereford was opened and was designated as a School of Technical Training. Many referred to the Station as RAF Credenhill but officially it has always been RAF Hereford. This view of the Station was taken in September 1940, the road to Stretton Sugwas runs from top left to right. It is of interest to note that the three aircraft at the bottom of the picture near the hangars were used for training purposes. As the war progressed, the strength of the station gradually increased to 7000 personnel (including 500 Polish and Czechoslovakian personnel). Most of the training courses delivered during this period were of a technical nature, the normal routine of the station was disrupted by regular air raid warnings. On the social front, many dances were held on the camp, to which local girls were always invited, In August 1941 the legendary Gracie Field gave a concert to a packed audience in one of the aircraft hangers, Flight Lieutenant Ralph Reader also directed 2 performances of the scout Gang show on the Station. At the end of the War, RAF Hereford had come through unscathed, thousands of men and women had been trained in many technical specialisations. By September 1945 the role of the station changed considerably, in addition to training for aircrew officers,administration/accounts and technical specialisations, it also became a recruit centre. 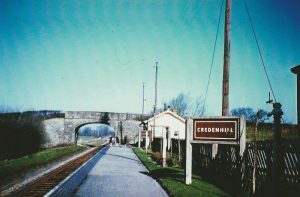 Interestingly the first input of recruits consisted of 960 personnel who arrived at Credenhill Railway Station(where the Community Hall and Social Club are currently located) and marched to the dispersal area off Station Road. At this time there were very few houses in Credenhill. Catering The RAF Cookery School moved to RAF Hereford in 1958 and occupied a purpose built training centre provided at a cost of £150,000. Administrative Apprentices 1954 to 1959 and 1963. (last entry passed out on 13 Dec 63. 23 April 1959 – RAF Hereford were awarded the Freedom of theCity and marked the occasion with a parade in Hightown in Herefordand a flypast of 6 Javelin aircraft. CCN equipment loan, Community liaison officer, use of facilities on the station.